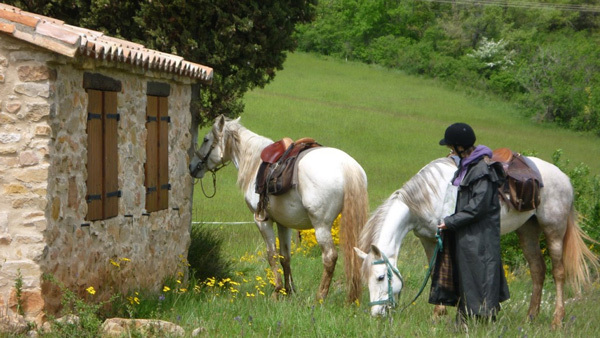 This ride is situated in the rugged countryside near the Spanish border. It is a chance to see a beautiful, mountainous area redolent of history and enjoy rural France and the hospitality and food of its inhabitants. The Cathar Trail takes its name from the religious group who inhabited the area during the medieval period. 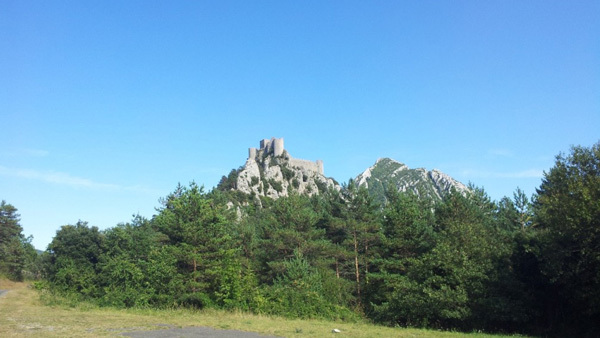 The trail runs between various towns and villages in which they lived, showing the ancient Cathar castles which they built to defend themselves against crusaders. In a small village with only 125 inhabitants Nicole has welcomed adventorous people during 25 years. To her help she has 20 well mannered and safe horses and nowadays also her daughter who is a riding instructor and competes in eventing. Here you can choose if you want to go in a group with a guide or by yourself on an ungided trail. The latter is for experienced riders who are prepared to take full responsibility for themselves and their horses. 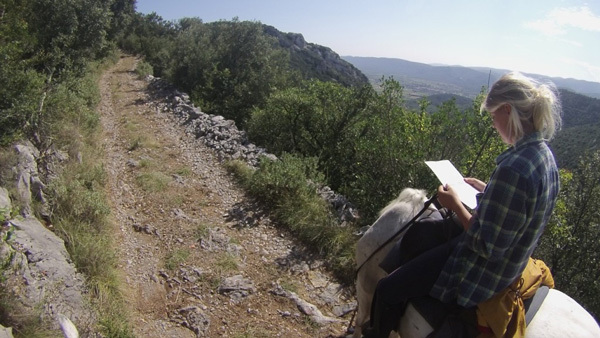 The route is carefully mapped out and arrangements made for riders and horses to spend each night in comfortable lodgings with excellent dinners. The region has a Mediterranean climate with hot and dry summers, perfect for the cultivation of vines and olive trees. In fact, the local Corbiere area is known for its wine, as well as its wild landscapes and low population density. 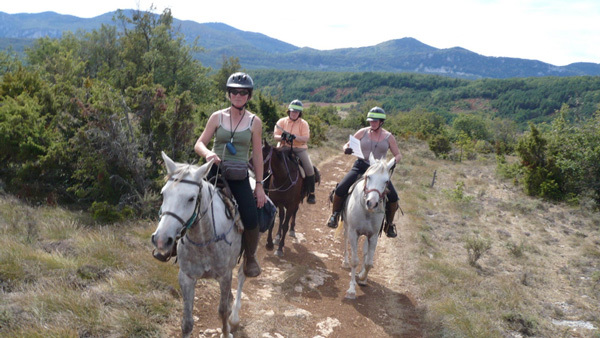 The horses here are chosen for their ability to navigate the tough terrain whilst also remaining a pleasure to ride. 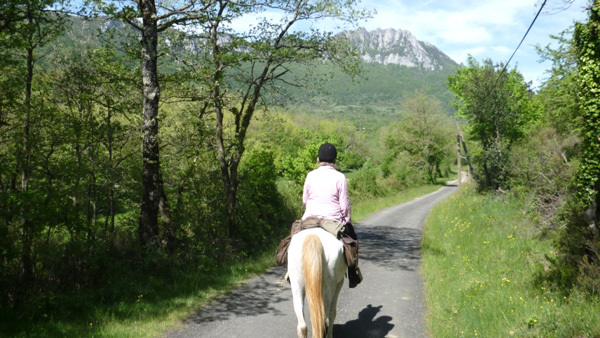 They will take you safely through the region and offer you exhilarating canters as you travel between lodgings, exploring this unspoilt part of Europe. 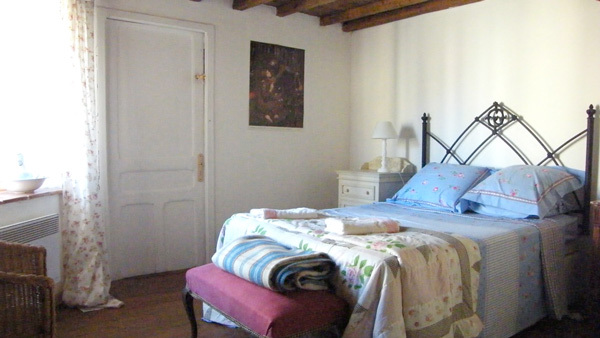 Accommodation is in B&B style home stays known as gites. This means a comfortable room and hot shower are available each night of the trail. This also gives a unique opportunity to meet local people, who are invariably delighted to meet you. Bathrooms may be shared and there may be 3 or more beds in one room. But with a supplement you can choose to have a double- or singleroom. Please note that if the gites are fully booked during peak season, hotels may be used instead where wine is not included. Dinners may include trout, grilled lamb or beef in a sauce and fresh produce of the local farms. Vegetarians can usually be accommodated with advance notice. Hearty picnic lunches will be provided fresh each day and carried along in your saddlebags. There are 20 well schooled horses of all shapes and sizes to choose from. From school masters and cobs to fast Arabs and a couple of ponies, there is certain to be a horse to suit you.The horses here are chosen for their ability to navigate the tough terrain whilst also remaining a pleasure to ride. 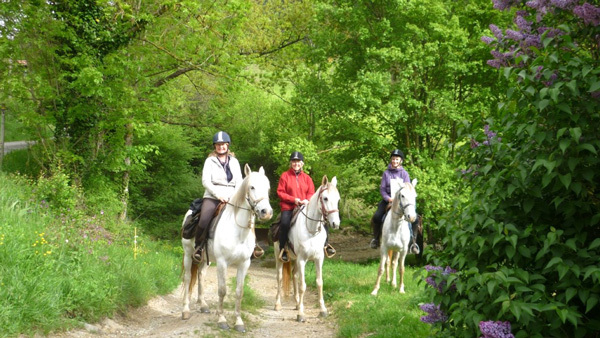 They will take you safely through the region and offer you exhilarating canters as you travel between lodgings, exploring this unspoilt part of Europe. The comfortable accommodation in family homes brings a wonderful end to each day. The riding can be at all paces depending on ability. Special trail saddles is utilised and the riding style is English. Saddle bags will be provided for you to put your water bottle, camera and immediate necessities in. You are advised to bring your own riding helmets as there may not be any available on site. 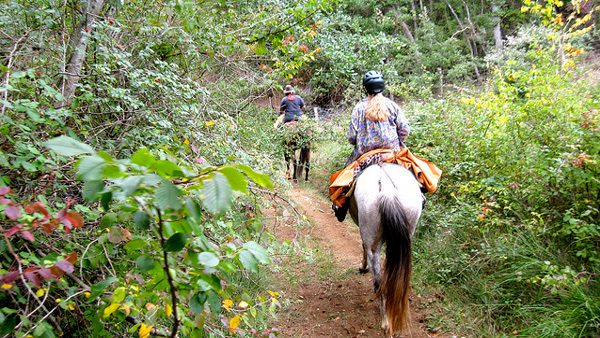 The terrain is very steep in parts and you will need to lead your horse in some sections. For the unguided trail you need to be comfortable caring for your horse – feeding, grooming, catching and saddling them daily. You need to be able to follow a route on a map and use a compass. You will also be given a written trail description. If, after the inital assesment ride, your host feels that a private guide will be necessary a supplement of 300 EUR will apply. It´s also beneficial to be able to speak some French in order to be able to get maximum enjoyment from the unguided experience. This is a fabulous opportunity for confident riders to ride unguided, on a well trodden route, through the beautiful mountains and forests. 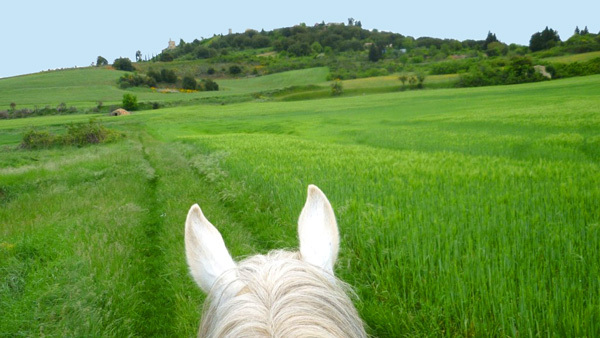 You will be riding very fit horses that are well trained to cope with the difficult terrain and who will safely carry you onto your new destination every day. Whilst this may sound daunting, you will be well equipped with map and compass. At the end of the day a warm welcome and delicious meal will be waiting for you. 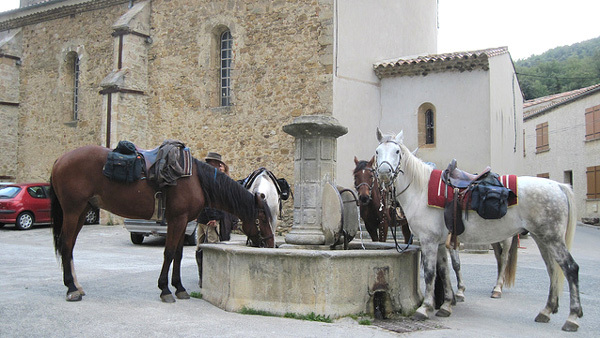 Day 1: You will be met in Carcassone and driven to your hotel where you will be served an evening meal. 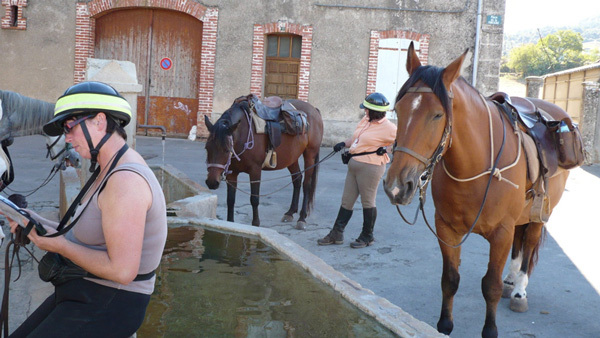 Day 2: After breakfast you will be driven to the stables in the quaint little village of Granes. This village is surrounded by forests and vine groves with a natural spring in the village square - the water is a delight to drink. Today is a 'test' ride with a guide to see how well you are able to read a map and compass. You need to be very comfortable with your horse before embarking on this trail as well being competent handling him/her both in and out of the saddle. If all goes well, you will be able to head out on your own on the following day. You will ride through woods past the village of Rennes-le-Chateau. After a picnic lunch, you will make your way back to Granes through a green oak forest for dinner and overnight as on the previous night. Day 3: Today you will start your adventure and leave Granes to make your way to Puivert (about 5 hours). 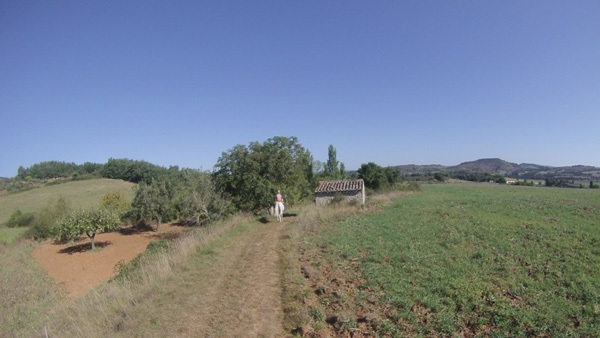 You will cross the upper valley of the Aude River, studded with vineyards, and arrive on the plateau of Puivert. You ride across the plateau and up into the courtyard of the castle ruin. 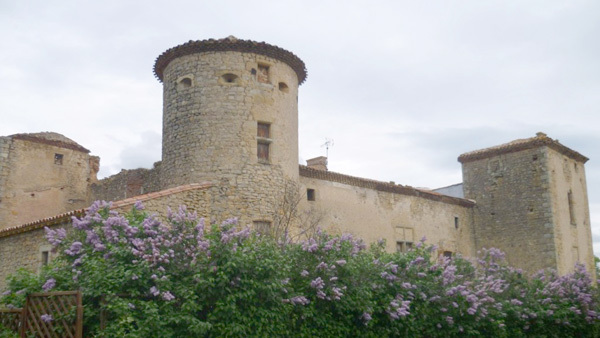 The Chateau de Puivert was subjected to a three day siege in 1210, by the army of Thomas Pons de Bruyere, and became property of the northern barons (having originally belonged to the Cathar family of Congost). After visiting the castle you make your way to Michel and Francois in the village nearby where you will spend the night. Michel and Francoise make and sell puppets from the workshop in their gite. 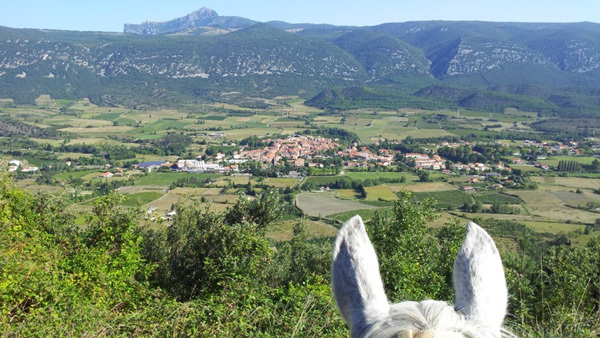 Day 4: After getting your horse ready we´ll follow the valley of Nebias, before climbing to the plateau of Coudons with a very beautiful scenery with the Pyrenées on the back. After a last canter, there is a long descent, before we cross the Rebenty valley and climb to the isolated hamlet of Labau on the side of a hill. The region is famous as the base for the Maquis during WW2. The journey from Puivert to Labau takes 5 to 6 hours. Labau is a small hamlet situated at the top of the valley and has the most fantastic views. Tonight your host is Patrice who rears Merens horses, famous for their trekking ability. Day 5: Today you ride from Labau to Ayguebonnes (5 hours). You will follow the valley of Rebenty where there are opportunities for faster riding. You will be able to visit another famous Cathar castle called Puy Laurens. This is an amazing castle described as a true masterpiece of military architecture and design. This magnificent fortress is placed high on a mountain top, surrounded by dark forests, and was once an impenetrable stronghold. You will spend the night in a farmhouse where the owners Collette and Christine raise cattle. The home cooked food here is delicious. Day 6: Today is the longest day with over 6 hours in the saddle. After crossing the valley of Fenouilledes and observing its small castles, you will head towards the plateau of Malabrac situated at the base of Bugarach Peak (4,500 ft.). Having explored this area you will ride trough the old village of Camps s/l'Agly, observing a big rock with rest of the walls of an old castle. 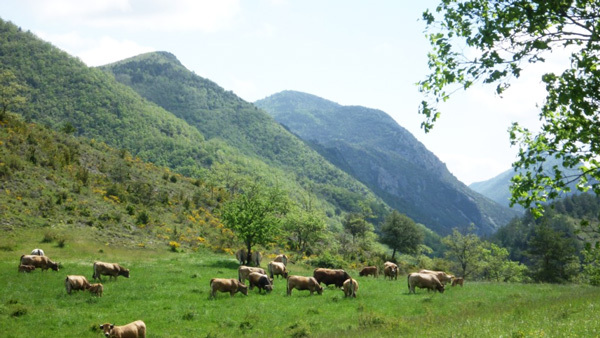 The night will be spent in an old hamlet where our host raise a local type of cows "Gascons". Day 7: Bouchard to Granes (5 hours). Today you ride through a reserve with deer and wild boar, following the valley of Bugarach at the north base of Bugarach Peak. Here you will traverse forests of pine, beech and oak, progressing into a small valley with large rocks of chalk and limestone. From here you return to your starting point in Granes. This trip will often take you over steep and difficult terrain. Riders therefore must be fit, able and willing to dismount and lead their horse in places. French speakers will be at an advantage on this trail, even those who know just a few words. Day 7: Today you cross the Bouchard Estate and pass by the Pech de Bugarach and the 'white valley'. You eat a delicious picnic by the river before travelling through the '4 ritous' valley. This leads you back into Granès and a farewell of your fourlegged companion. Kathar trail with guide is scheduled the following dates 2019: April 21st, May 5th, June 6th and September 1st. Other dates is possible if you are a group of minimum 4 persons. 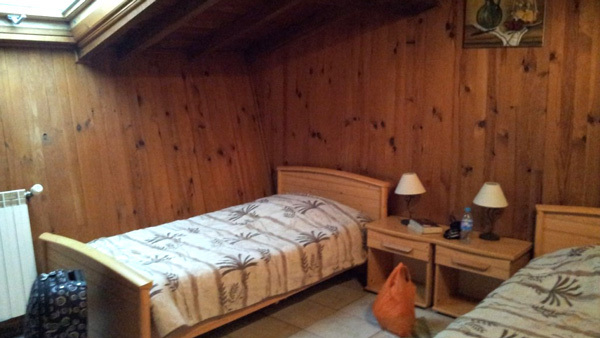 Double room: Can be booked with a supplement. For price click on ”Book on request” under Dates & prices. Not included: Flights, transfer, insurance, drinks and extras not mentioned. Travel: Book flight/rental car >> We help you book your flight if you wish. Fly to Carcassone (closest), or Paris or Toulouse Airport. Train: to Carcassone. Train from Paris Gare de Lyon, via Montpellier to Carcassonne (approx. 5 ½ hours depending on which train). It´s also possible to catch a train from Toulouse Airport to Carcassone. 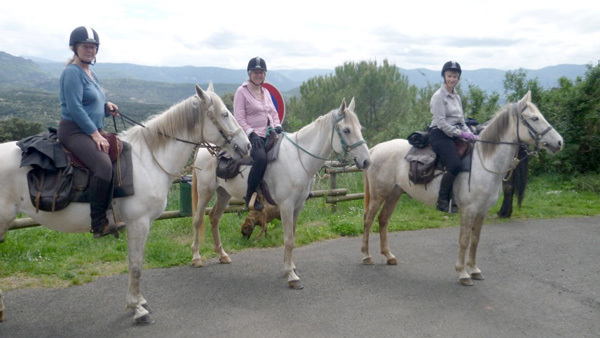 1 hour transfer return Carcassone 35 EUR / person payable to the riding centre. Arrival and departure time trail : The best time to arrive to Carcassone Airport is Saturday afternoon / evening, and departure around 11.00 am. Group size: Min.2, max around 10 persons on the guided trails. Min. 2 and max. 6 persons on the unguided trail. Currency: Euro. The easiest is to bring a credit card so that you can withdraw cash from the ATM at the airport or in the villages. Some places on the trail do not accept credit cards. Credit card: The Riding Centre does not accept credit cards. Season: April – October for the unguided trail, special set dates for the guided trail. Age limit:10 years old coming with a riding parent. Shower gel, shampoo: Please bring your own.